PLEASE NOTE: Newsletter sign up is not available at this time, but please feel free to read all of the REPORTS FROM THE TRAIL by clicking on the individual links below. 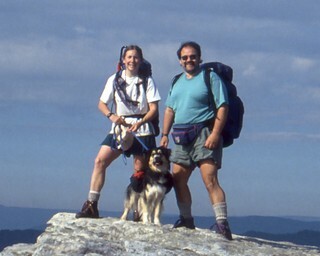 During the final week of our Appalachian Trail thru-hike it seemed as if the pathway was purposely trying to provide Laurie, MacAfee of Knob (The Amazing Appalachian Bouncing Dog), and me with a summary of everything we had experienced on the entire journey. The last 77 miles of the trip were filled with waterfall-studded creeks, 3,000-foot gains and loses in elevation, great views, rhododendron-lined trout streams, remote forest glens, open mountain meadows, temperatures cool enough that Mac enjoyed snuggling into the sleeping bag Laurie carried for him, and ample opportunities for quiet, isolated, and scenic campsites. I always looked forward to restful sunsets at the end of a long day of hiking, and Humpback Rocks in central Virginia treated us to one of the best. Dark clouds covered most of the sky, but the western edge was clear, providing a small window to watch the sun drop below the far ridgelines, painting the entire sky a bright mixture of oranges, yellows, pinks, and reds. And is there anything more glorious and heartening than a simple sunrise, when that celestial orb rises above the eastern horizon, bringing with it the promise of a fresh day, filled with an infinite number of experiences that we can pick and choose from? We would awaken each morning on the trail a few minutes before sunrise, just as the grainy, gray atmosphere of twilight retreated. New sunrays would shine on the forest, bringing leaves, tree trunks, and underbrush into a sharply defined, three-dimensional focus through the interplay of shadows with light. Our ascent of Punchbowl Mountain was made even more gratifying by the early morning’s alpenglow bathing the world in a soft pinkish hue. Wildflowers had been so abundant throughout the journey that it was impossible to ignore them; some had persisted even into November. Reflecting the golden rays of the sun, black-eyed Susans dotted open meadows, while chicory lined old woods roads, mirroring the cleanliness and clarity of an unclouded sky. As I stated in my last report, the trail is also a lesson in U.S. history, and our final week took us past still-standing chimneys and long-forgotten cemeteries with crumbling gravestones. A community of freed slaves farmed and inhabited the land around Brown Mountain Creek until the second decade of the 1900s. It was easy to imagine the bustling life that went on here as we walked by old foundations, remnants of stone springhouses, and terraced slopes. We would never have accomplished this trip if not for total strangers who were willing to drive us into towns so that we could re-supply or invite us into their homes to take showers and enjoy home cooked meals. During this final week it was people we never even met who helped us out. Drought conditions in central Virginia had dried up most of the trail’s water supplies, yet we were never thirsty because kind persons had taken it upon themselves to travel many miles to road crossings to leave jugs of water for us hikers. The final few days of the thru-hike were bittersweet. Sure, there was the knowledge that we had completed the entire Appalachian Trail, but there was also the sadness that the journey was coming to an end. I almost had the strong urge to just continue walking so that I could remain on this pathway that had been such a comfortable home for me for the last eight months. Virginia’s longest waterway, the James River, marked the end of the trek for us. There was no screaming, running, or shouting as there had been when we had accompanied northbound thru-hikers to the trail’s northern terminus on Katahdin in Maine a couple of months ago. There were no cheering crowds to greet us, no fireworks, no band playing a triumphant fanfare. We, however, didn’t need any of that. We had the quiet satisfaction that comes to anyone who has followed his or her own set of rules to reach a self-established goal. Bob and Shell Ellinwood, friends we had met on a previous Appalachian Trail thru-hike, were the only people to meet me, Laurie, and Mac as we stepped out of the woods. Some hugs, a few slaps on backs, final photos, and the journey was over. Yes, the Appalachian Trail is located next to the heavy populations of the east coast, so it certainly can’t be called a true wilderness. Yet, the protection it provides insures that at least a 2,000-mile strip of land will be left in its wild and natural state. May it stay forever wild. 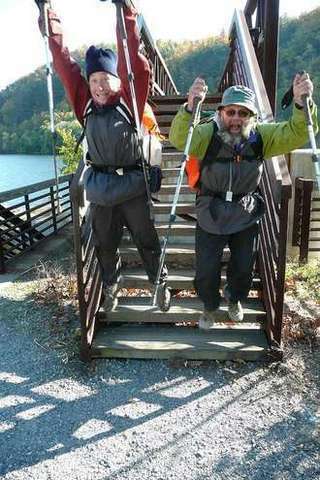 Leonard M. Adkins has developed a multimedia presentation that depicts a typical thru-hike of the Appalachian Trail. Interested schools, groups, corporations, and organizations may reach him at habitualhiker@verizon.net.